The burden of OA of the knee is largely attributable to the effects of disability, comorbid disease, and the expense of treatment. OA is the most frequent cause of disability among U.S. adults, and the burden is increasing due to the rising disease prevalence as well as higher expectations among patients to receive effective treatment. OA is the leading indication for joint replacement surgery. About 905,000 knee and hip replacements were performed in 2009, costing the healthcare system $42.3 billion. These estimates factor together direct medical, long-term medical, home modification, and nursing home costs. An inability to return to prior living circumstances. A need for increased levels of care and supervision. A reduced quality of life. A decreased level of mobility and ambulation. The American Academy of Orthopaedic Surgeons (AAOS) recently introduced a new clinical practice guideline (CPG) for adults undergoing surgery to improve motion and relieve pain caused by OA of the knee. The guidelines focus recommendations on total knee replacement (TKR), the surgical procedure most commonly performed for this condition. 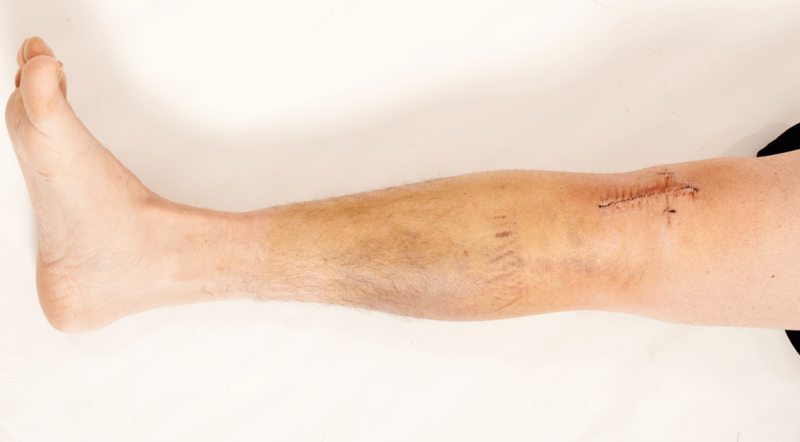 TKR is a safe and effective technique that benefits patients immensely, according to David S. Jevsevar, MD, MBA, who chaired the AAOS committee that developed the CPG. “Many of the recommendations in the CPG are strongly recommended because the literature and other evidence of good outcomes were compelling,” he says. In addition to AAOS, several other organizations have endorsed the CPG, including the Society of Military Orthopaedic Surgeons, the Arthroscopy Association of North America, the American Geriatrics Society, the American College of Radiology, the Knee Society, and the American Association of Hip and Knee Surgeons. Published online for free at http://www.aaos.org, the AAOS document is intended to assist clinicians in the management knee OA among adults aged 18 and older. It is not intended to address management of pediatric patients with OA or for patients with inflammatory arthritis of the knee. The CPG provides guidelines for physicians and patients to consider when making decisions about knee replacement. A patient’s lifestyle and expectations, in addition to physician experience, can heavily influence treatment decisions. 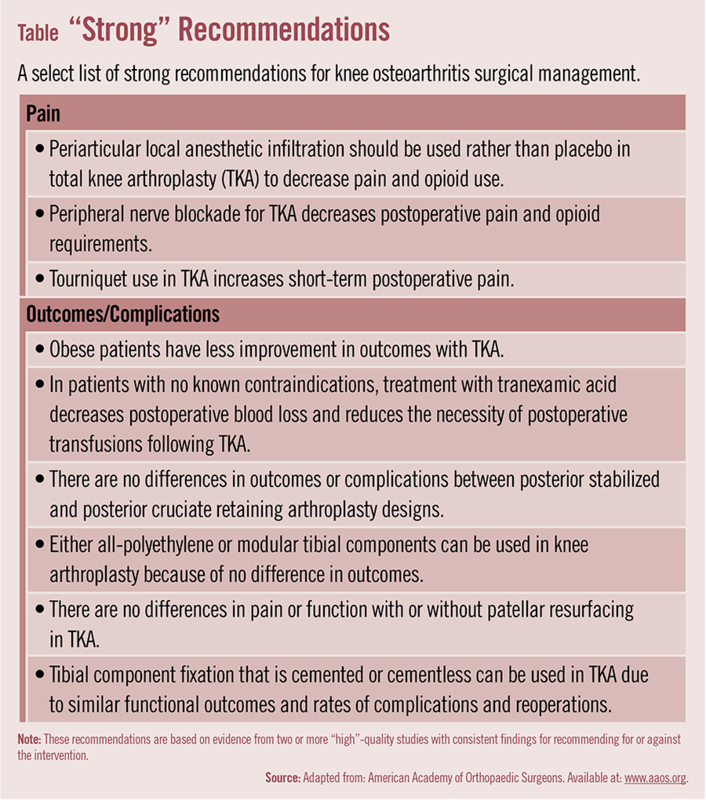 Several CPG recommendations in the AAOS document received a “strong” rating, including the reduction of risk factors, such as weight and smoking, as well as administration of multi-modal anesthesia, including local anesthetic and nerve blockades around the knee joint to decrease pain and opioid use following TKR (Table). Treatment with tranexamic acid is recommended to decrease postoperative blood loss and transfusions following TKR. Another important recommendation is to start rehabilitation on the same day that TKR is performed. This is critical to reducing length of hospital stay and getting patients ambulatory more quickly. The CPG also issued strong recommendations on what should not be done when managing patients with OA of the knee. Intraoperative navigation in TKA should not be routinely used because there is no difference in outcomes or complications, according to currently available evidence. Patient-specific instrumentation is also not favored over conventional instrumentation for TKA because researchers have seen no difference in pain or functional outcomes. A drain should not be used with TKA, and continuous passive motion after knee arthroplasty does not improve outcomes. In addition, the AAOS notes that there is a need to investigate protocols, the delivery of interventions, and strategies to improve adherence to optimize outcomes. Future investigations should also address the influence of physical activity on prevention of weight gain and on survival of prosthetic device used in TKA. The association also recommends incorporating cost and cost-effectiveness into future clinical studies. American Academy of Orthopaedic Surgeons. Surgical management of osteoarthritis of the knee: evidence-based clinical practice guideline. Available at: http://www.aaos.org/uploadedFiles/PreProduction/Quality/Guidelines_and_Reviews/guidelines/SMOAK%20CPG_4.22.2016.pdf. Murphy L, Helmick CG. The impact of osteoarthritis in the United States: a population-health perspective.AM J Nurs. 2012;112(Suppl):S13-S19. Perruccio AV, Power JD, Evans HM, et al. Multiple joint involvement in total knee replacement for osteoarthritis: effects on patient-reported outcomes. Arthritis Care Res. 2012;6:838-846. Topp R, Swank AM, Quesada PM, Nyland J, Malkani A. The effect of prehabilitation exercise on strength and functioning after total knee arthroplasty. PM R. 2009;8:729-735. David S. Jevsevar, MD, MBA, has indicated to Physician’s Weekly that he has or has had no financial interests to report.